When your pick comes up on draft day you will know the ADPs and hopefully have your tiers laid out as you see them, but you still have to determine which player to target at that spot. Will you go with safe and steady performer or will you shoot for the stars and chase the upside? More often than not those owners that hit on the guys that break out and get good value on them wind up winning fantasy leagues. Gronkowski is a near lock to lead the position in fantasy points if he can just stay healthy. However, staying injury-free has been something that hasn’t come easy for him as he has missed 26 games in over the past six years. He appeared in 16 games in each of his first two pro campaigns but has failed to do so in the six seasons since. When on the field Gronk has dominated, finishing inside the top five in fantasy scoring in every season since 2011 where he’s played in at least 11 games. That includes being TE1 three times in PPR formats and four times in standard leagues during that span. He comes with a steep price considering the risk, but those who land Gronkowski will enjoy his production when he’s in the lineup. Over the past two years he’s averaged 81 yards across 20 games with 11 touchdowns. 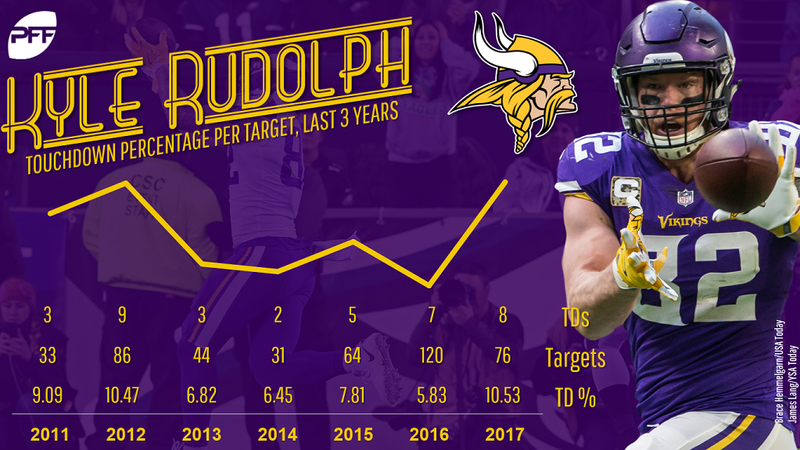 Rudolph saw a big dip in targets last season, going from 120 targets in 2016 to seeing the ball thrown his way just 76 times. He netted only 57 catches for 532 yards after pulling in 83 balls for 840 yards in the previous campaign. His upside, though, comes from his knack for finding his way in the end zone. The one number where Rudolph didn’t see a dip in 2017 was in his touchdowns. He scored one more time a year ago than his previous campaign and now has 15 trips to the end zone over the last two years. The arrival of Kirk Cousins is expected to give the entire offense a boost and Rudolph is no exception. Of the 99 passing touchdowns Cousins threw in Washington, 27 of them had a tight end as the recipient. Rudolph projects a bit better in standard formats but offers top-five potential. Reed has teased us with his potential, but he continues to disappoint us with his durability. Unfortunately, 2017 wasn’t much different. He missed large chunks of time in training camp with a toe injury and never seemed to reach full health. He finished last season as fantasy’s TE43 after playing in just six games. Reed caught 27 of 33 targets for 211 yards and three touchdowns. He has now missed 28 games over five years in the league. He scored 11 times in 2015, but has just 11 total touchdowns throughout his other four seasons as a pro. The injuries aren’t the only concerns with Reed. The Redskins have a ton of changes in store on offense, headlined by Alex Smith taking over at quarterback. It’s hard to imagine him breaking his injury trend, but as he continues to slide down the draft board Reed could be worth a gamble. The 2017 draft class was loaded with some nice talent, but Njoku may very well top the list. He reeled in 32 of his 58 targets for 386 yards and four touchdowns as a rookie and definitely showed progress as the year wore on. Expect his size and freakish athletic ability to be utilized even more in the red zone this season. The Browns have gone through a major offseason offensive makeover and if the moves pan out Njoku could start producing sooner rather than later. The arrival of Jarvis Landry alone should really open things up for Njoku over the middle. Even in his limited action in 2017, Njoku graded out as PFF’s 10th-best receiving tight end. He also had the fourth-best average depth of target (11.6) among all tight ends that played at least 50 percent of their team’s snaps. Look for improvement in his numbers in 2018. Like Gronkowski and Reed, Eifert’s fantasy success boils down to his durability and to this point of his career the Bengal tight end has come up short. He has missed 40 of his last 64 games with myriad injuries, including back surgeries the last two seasons. There was little interest in the oft-injured tight end during free agency this offseason, so the Bengals brought him back on a modest one-year, $5.5 million deal. He figures to remain heavily involved in the team’s passing attack if he can stay on the field. Eifert’s success in the red zone is what makes him appealing. Over his last 22 contests he has scored an eye-popping 18 times. If he can just play 12 games this season and score and produce at that rate he could hit double-digit TDs. At his current 12th-round price the injury risks fade, but he’s best served as an upside TE2. Rather than be on the hook for $8.25 million in 2018 the Lions cut Ebron, who they selected with the 10th overall pick in the 2014 draft. He was quickly scooped up by the Colts and joins Jack Doyle on the depth chart. He had a nice stretch of games in 2017 but has mostly been a disappointment as a pro and a borderline starting fantasy option at best. Through his first four years Ebron has only eclipsed 575 yards once and scored just 11 times while averaging 7.2 yards per target. He has 23 drops on 277 career targets. Ebron is expected to be part of many multiple-tight end sets with Frank Reich and Nick Sirianni now serving as the head coach and offensive coordinator in Indy. With Andrew Luck’s shoulder looking to be healthy, the former Lion is looking like a great late-round TE2 target based the lack of other experienced weapons in the Colts’ passing attack.